We once again worked with the London based sports agency LiveWire Sport to create a 2 minute animation that celebrated Inter Milans 110 year history. The video was released on the clubs official 110th birthday via their range of social media channels. It was also shown at their next home game vs Napoli. Storyboards were created in an effort to capture the main moments from the clubs rich heritage. Style setters were then illustrated to be signed off by the club. Then a series of illustrations were produced by us, which were animated by the team at LiveWire. Special effects, music and a voice over from the legendary James Richardson were also added. 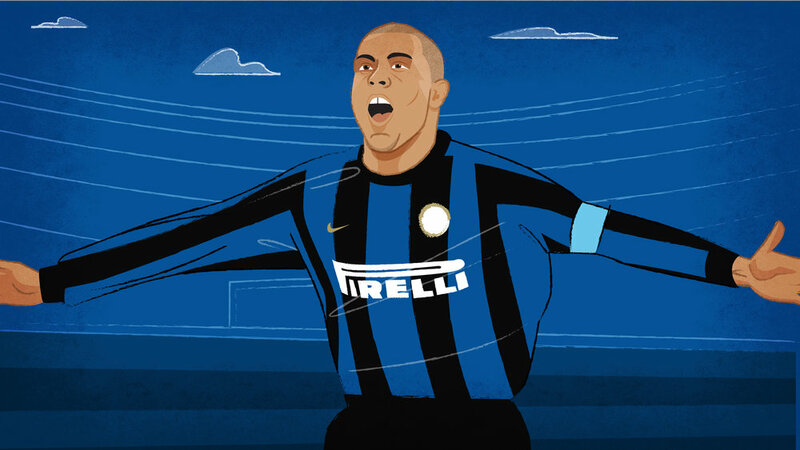 The final animation was created in English, Chinese and Italian to reflect the global fan base of Inter Milan. This helped us to lock in certain constants throughout the animation. For example, the same blue texture background was used throughout, as was the use of simple line work to create backgrounds. An unused moment from the early storyboard that was later cut to ensure we hit the agreed 2 min running time. An early version of the introduction. The typeface aimed to convey the feeling of heritage and history but was deemed too difficult to read when seen at smaller sizes so was replaced with a font family chosen by the client.